If you're looking for a simple way to import Microsoft PowerPoint slides into the GoldMail multimedia presentation package, you'll find the GoldMail Add-in for Powerpoint a solid bet. It's free, it does the job quickly, and you'll be able to import the slides in seconds. With just a few clicks, GoldMail Add-in for PowerPoint sends slides to GoldMail for sharing. In case you don't have a copy of GoldMail, and aren't sure why you would need the GoldMail Add-in for PowerPoint, here's a brief rundown. GoldMail lets you create and share slideshows that includes voice-overs that you record. It's quite easy to use. 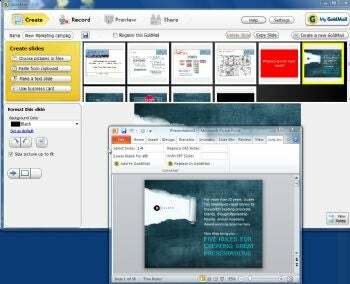 First create slides by copying them from a clipboard, a file or by making text slides by using built-in tools the program has. When you've done that, you can write a script for yourself inside the program, so that you don't stumble when you record your voiceover. After that, record the voiceover. The entire presentation is saved on the GoldMail site. At that point you can have GoldMail send an invitation, using your e-mail software, to people to view and listen to the presentation; the e-mail will include a link. You can also post a link on a Web site, or use it in any other way. You can't send the GoldMail presentation itself, but you can embed a player in a blog or Web site so that people can see and listen to the presentation that way. The GoldMail Add-in for PowerPoint makes it much easier to create your presentations. One problem with GoldMail is that you can preview entire presentations before you put them into GoldMail. So you'll find yourself adding slides and deleting them until you find the ones you want. GoldMail's add-in integrates directly inside PowerPoint. When you're in a presentation, click the Add-In tab, and then use it to select slides to send to GoldMail, or replace existing slides in a presentation you've uploaded to GoldMail. They'll be sent to the presentation you're currently creating. It's a much more efficient way to get slides into GoldMail Be aware that it may take several minutes for the slides to get sent from PowerPoint to GoldMail, so don't get impatient. This link takes you to the vendor's site, where you must register for the service to download the software. Also, the GoldMail Free limits your message length to three minutes, and you can only have five messages active on the site simultaneously. GoldMail costs $9.95 per month if you want to have a 10-minute length and unlimited number of messages hosted. If you're a user of GoldMail, then getting this add-in is a no-brainer: You absolutely want it because it makes it much easier sending PowerPoint slides to GoldMail. If you haven't used GoldMail yet, you'll have to first decide whether you want to use that program, and if you do, you'll want to download this PowerPoint add-in.